Craving for authentic Punjabi rajma masala recipe? You are at the right place. 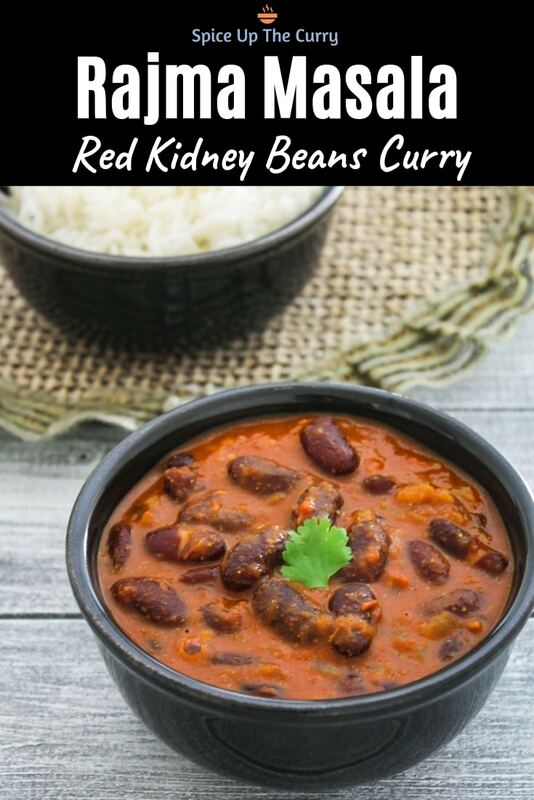 This kidney beans curry is very easy to make with basic ingredients. Not to forget, it is very delicious, comforting and healthy dish. Rajma masala is a popular North Indian dish that is made very often in Punjabi households. Boiled Red kidney beans are simmered in spicy onion-tomato gravy. In short, it is Indian style red kidney beans curry. It is best served with rice hence the name rajma chawal. This rajma recipe is a healthy dish. This is very simple version of making it.Today I am sharing the method which I cook at home very often as I love rajma in any form. Not only this one but I like all kind of beans in any form. I usually make any beans curry like punjabi chole, lobia masala or punjabi kala chana once or twice a week. Because beans are full of protein and as being vegetarian, this is the good source of protein in my diet. Red rajma (red kidney beans) – In this recipe I have used this kind. As you can see in the pics below they are dark red in color and they hold their shape after cooking. And they absorb the flavors very well. Chitra Rajma – The shape is same as red rajma but the color is slight off-white and it has red speckles on it. They are soft in texture once cooked and widely used in Kashmiri cuisine. Black rajma – The shape and size is same as red ones. But the color is black. These are not the same as black beans. White rajma (White kidney beans or Cannellini beans) – Very rarely used in Indian cooking. But widely used in Italian cooking. How long to soak rajma before cooking? Wash rajma under running cold water till water runs clear. Soak them in enough water for at least 8 hours or overnight. It should get bigger in size after soaking. This helps to reduce the cooking time. After the soaking time discard the water. Forgot to soak the rajma a day before? Here is quick soaking method for you. Take beans and plenty of water in a pan. Bring the water to a rolling boil and let it boil for 2-3 minutes. Then turn off the stove and cover tightly with lid and let it sit for 1 hour. Voila, after 1 hour your beans are at the same stage where you have after overnight soaking. How many whistles to cook rajma? To pressure cook the rajma, Cook for 1 whistle on HIGH flame then reduce the flame to LOW and cook for 10 minutes. Let the pressure go down by itself and then open the cover. 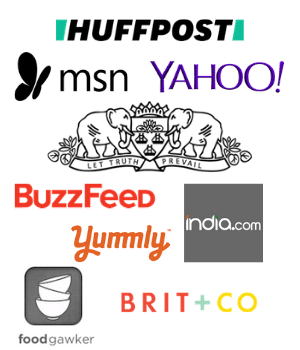 This cooking time may vary depending on the type or quality of your rajma. So cook accordingly. Cooked rajma should be soft and some of them will open up. How to make Punjabi Rajma Masala Recipe? Heat the oil in a pan on medium heat. Once hot add bay leaf and saute for 30 seconds. Then add chopped onions and sprinkle some salt. Cook the onions till they get light brown in color. Add ginger and garlic paste. Saute for a minute or till the raw smell goes away. Mix well and let it cook. do stir in between to make sure that it is not sticking to the pan. Cook till all the moisture evaporates and oil starts to leave the sides of the pan. Add spice powders (Turmeric powder, red chili powder, coriander powder and cumin powder and garam masala). Mix well and cook for a minute. Then add Boiled rajma along with its water. To get more thick gravy, mash few rajma with the back of the spoon or spatula. Mix well and let it simmer for 5 minutes. Check the salt and other spices. If gravy is too thick then add some water and bring it to a boil. If gravy to too thin and watery then let it simmer for few more minutes or till you get your desire gravy consistency. Serving suggestion: Traditionally rajma is served with steamed rice as a meal. You can have it with paratha or roti/phulka. Can I use canned kidney beans? Yes, You can use 1 can (15.5 oz) of red kidney beans to make this curry. Personally I do not prefer processed, canned food in my cooking. I highly recommend you do the same and boil your own beans at home. You can see it’s very easy. 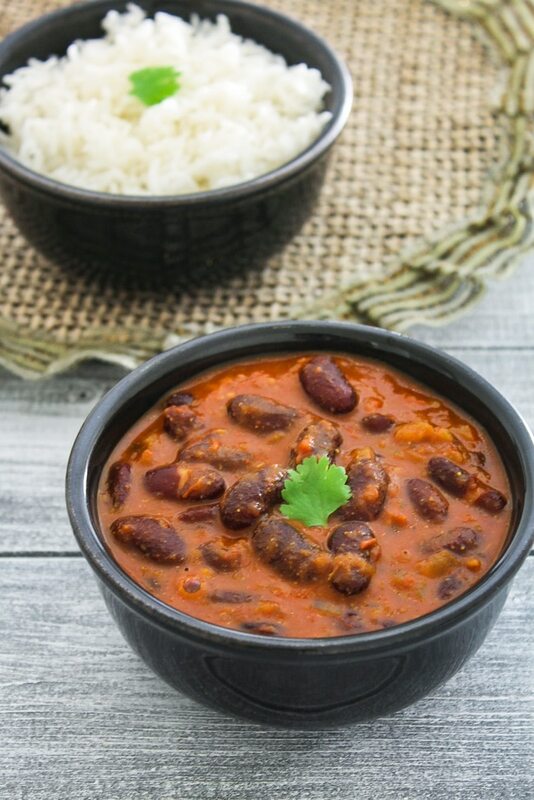 Punjabi Rajma Recipe – this is healthy, delicious, comforting meal served with rice. 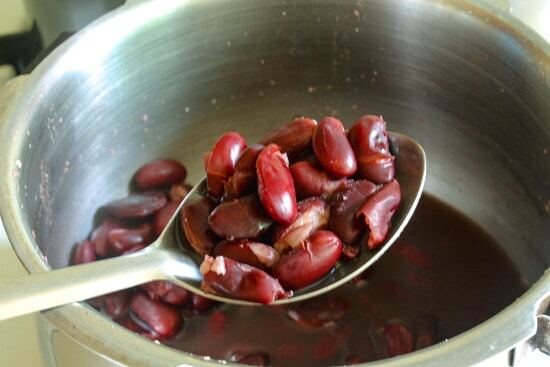 Here red kidney beans are simmered in onion tomato gravy. Soak them in enough water for at least 8 hours or overnight. It should get bigger in size after soaking. This helps to reduce the cooking time. Now discard the soaking water and add rajma to the pressure cooker with 1 ½ cups of fresh water. Close the lid and put the weight on. Cook it for 1 whistle on HIGH then reduce the heat to low and cook for another 10 minutes. Let the pressure go down by itself and then open the cover. This cooking time may vary depends on the type or quality of your rajma. So cook accordingly. After pressure cooking the rajma, they should be soft and some of them will open up. Heat the oil in a pan on medium heat. Once hot add bay leaf and saute for 30 seconds. Then add chopped onions and sprinkle some salt. Cook the onions till they get light brown in color. Now sautee ginger and garlic paste for a minute. Add tomato puree. Mix well and let it cook till all the moisture is evaporated and oil starts to leave the sides of the pan. do stir in between to make sure that it is not sticking to the pan. Add all spice powders. Mix well and cook for a minute. Then add Boiled rajma along with its water. Mix well and let it simmer for 5-7 minutes. Check the salt and other spices. I made this last night and it was only as I was making it that I realised I was making a basic curry sauce with beans instead of meat, I also had it with chapatis in place of my usual basmati rice, it was very tasty and I don’t know why I always use meat when using beans is so nice, I may be a vegetarian convert! true this is basic Punjabi curry sauce with beans. I just watched Tony Singh in The Punjab making Rajma and I must try it for myself, it looks delicious! Im just off to buy some red kidney beans right now! do give it a try and let me know your feedback. Would I be able to use tomato paste instead of pureed tomatoes? This recipe looks delicious.